A true Master of Martial Arts don't always take themselves seriously. This blog just proves the point. Be sure to be easy on the target, it's quite a deadly punch. 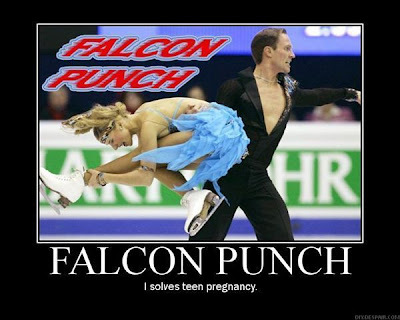 Falcon Punch - Deadly Punch. 10. The referee argues about whether he can bring his walker on the mat. 9. The referee borrows a pair of glasses from the corner judge. 8. The referee keeps going up to Japanese fans and asking if they are Yasuhiro Yamashita. 7. Your opponent's sleeves are folded up to the elbows, and the referee doesn't notice. 6. Your opponent has gotten up 3 times before the referee decides that the first throw scored ippon. 5. He still thinks the pistol grip refers to a technique in the Goshin Jutsu. 4. The referee carries a stop watch to time 3 seconds for newaza. 3. The score reaches 3 waza-ari to 2 waza-ari, and you're still fighting. 2. During meetings the referee and corner judges exchange money. 1. After the match, the referee can't find his shoes!